Crews clean up mounds of snow from South Union Street in Middletown. The job of removing snow from Middletown streets will continue through Friday, Jan. 29 and possibly into the weekend, acting Public Works Superintendent Chris Burkholder told the Press And Journal on Thursday, Jan. 28. Crews will focus on removing snow from main snow emergency routes on Friday, just as they had on Thursday. Then they will move to other problem areas – narrow streets and intersections, Burkholder said. 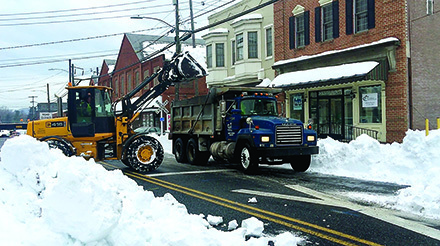 Minutes after Middletown Borough Council approved an emergency disaster declaration on Monday, Jan. 25, Burkholder was on his cell phone in council chambers hiring a crew from ATO Excavating of Hummelstown to assist with getting the snow off the streets. The emergency declaration allowed Burkholder to bypass competitive bidding that would have taken weeks before he could bring outside help on board. But with cars, trucks and school buses paralyzed all over town by huge piles of snow – snow that wasn't melting anytime soon – Burkholder could not wait weeks, days or even hours. After lining up ATO, Burkholder got a call from another contractor offering help, Peifer Constuction from Eisenhower Boulevard. Before long a third was on board, Doug Shope of Middletown. ATO, Peifer and Shope rushed in with dump trucks and drivers. Besides the borough's own public works fleet, Suez – the company that runs the town's water and sewer systems – lent a back hoe, a large dump truck and a second single axle dump truck, as well as operators, to help with removing snow, Burkholder said. Even more outside contractors are available as a back up. However, Burkholder said too many contractors and trucks could cause a problem if they get backed up while dumping the snow. The declaration provides the borough an opportunity to apply to county and state governments for reimbursement to cover a portion of the costs related to the snowstorm clean up, if not the total price tag. A steady stream of trucks filled to the brim have dumped snow at four different locations in town – the paved lot at the far eastern end of Hoffer Park, the parking lot on Susquehanna Street next to the football field, the parking lot next to the athletic field along Oak Hill Drive and the dead end at Few Avenue, near where houses were razed after Tropical Storm Lee in 2011. As truck after truck dumped its snow payload, operators in front end loaders pushed the snow in to keep the pile as compact as possible. "I don't think we will run out of space" to put the snow, Burkholder said. The main focus on Wednesday Jan. 27 was clearing enough snow so that schools could reopen. Burkholder spent the first part of the day riding all over town with William Meiser, director of operations for Middletown Area School District, and an official from the bus company. The two pointed out all the locations where snow blocked buses from turning or picking up and dropping off students. The No. 1 priority all along has been getting and keeping the roads open for fire trucks and other large emergency vehicles, Burkholder said. Going forward, the crews will continue removing snow, although it will not be possible to remove all the snow from borough streets – it likely will melt before then, Burkholder said. In some areas, removing the snow isn't necessary – it can be pushed aside into an empty lot, if one is available. However, crews want to be careful not to push snow back into a parking space that someone spent several hours shoveling out. "We also don't want to put a 1,000-pound pile of snow into someone's driveway," Burkholder said.